In the wild, as it were, champagne truffles are made from marc de champagne. Now, while the process is in a way related to the champagne process, it is really a brandy that is produced by distilling the grape skins, seeds and stalks that are left over from the pressing process in the first stages of champagne production. But it isn’t champagne – its brandy. These truffles are different – these truffles are made with real champagne – but not just any champagne… they are made with one of my favourite champagnes – Laurent Perrier. On the occasion of its 200th birthday, the Laurent Perrier chose to team up with William Curley and created these delicious truffles. So delicious I couldn’t help myself and ate two before photo’ing them. 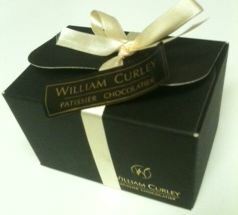 Now, I’m a fan of William Curley’s patisserie and I love eating at his dessert bar. When he added champagne to it, I made sure to always order a dessert bar with champagne. 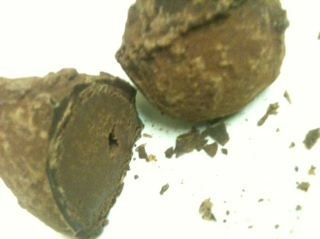 But now he’s taken my one of my favourite champagnes and created a truffle from it. The dark chocolate in this truffle balances nicely off against the chocolate as it is not too bitter and the flavour of the champagne comes clearly through.